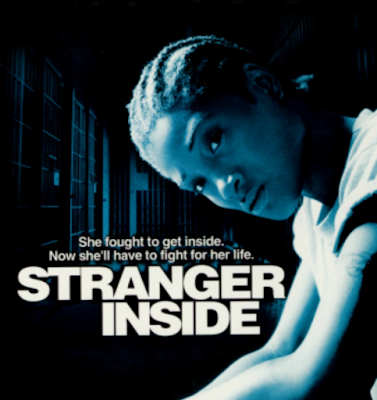 Today's movie choice is one of my favorite, real and raw stories that is very relatable and it's "STRANGER INSIDE". This film that was released in 2001, directed by Cheryl Dunye. Starring Yolanda Ross, Davenia McFadden, Rain Phoenix, Ella Joyce. This film strikes a core with us all because if we truly don't understand who we are we come apart of our environment. If we understood where/ who we come from we won't repeat what's happened before us. Treasure is a young African-American woman who grew up without a mother and has been in trouble with the law most of her life after falling in with a rough-and-tumble street gang. Treasure has long been told that her mother, a hard-as-nails female criminal nicknamed "Brownie," died years ago, but one of Treasure's best friends and gang-sisters tells her about meeting a hard-core "lifer" named Brownie in an adult lockup, and Treasure wonders if she might be her mother. About to turn 21, Treasure goes out of her way to break enough rules to be sent to the State Facility for Women, where Brownie is also held. Treasure soon meets Brownie and discovers she is indeed her mother, but finds that the longtime prisoner would prefer to regard her as a gang ally than as a daughter.